Cyclin D1 antibody LS-C18809 is an unconjugated rabbit polyclonal antibody to human Cyclin D1 (CCND1). Validated for ELISA and WB. Full length synthetic polypeptide corresponding to the human gene sequence. This antibody has been tested for use in ELISA and by western blot. Specific conditions for reactivity should be optimized by the end user. Expect a band approximately 34 kD in size corresponding to Cyclin D1 by western blotting in the appropriate cell lysate or extract. Anti-Cyclin D1 is suitable for the detection by immunoblot of human, rat and mouse Cyclin D1. 0.02M Potassium Phosphate, 0.15 M Sodium Chloride, pH 7.2 with 0.01% (w/v) Sodium Azide. Western blot analysis is shown using Anti-Cyclin D1 antibody to detect Human Cyclin D1 present in asynchronous HN30 cell lysates. HN30 cells, are from head and neck cancer cells that over express cyclin B1 and D1. 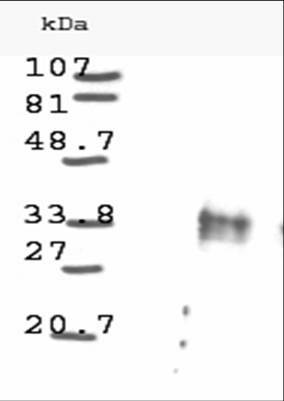 Comparison to a molecular weight marker indicates a band of ~34 kD corresponding to the expected molecular weight for the protein (arrowhead). The blot was incubated with a 1:500 dilution of the antibody at room temperature. Detection occurred using a 1:10000 of HRP conjugated Go.